Aircraft importation in the EU: is the term “predominately used for business” accepted by various EU VAT authorities? Extra comments have been added below and new survey questions can be seen in survey no. 3. New survey questions: does the flight pattern/geography and the size/type of compensation matter? Survey no. 2 about VAT exemption for aircraft have also been updated with extra comments. It is a common misunderstanding that it is acceptable to reclaim all of the import VAT even if the aircraft is only used predominately for business purposes. 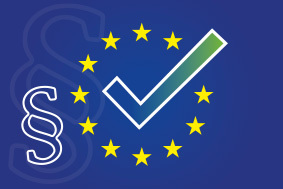 We have therefore commissioned a verification survey in various EU member states known for aircraft importation. The survey has been made by an international consulting firm. The general rule is that the import VAT can be reclaimed 100% only if the aircraft is used 100% for acceptable VAT taxable economic activities. Any persons using the aircraft for private / ­personal /­ entertainment purposes must compensate the importer directly for the use – otherwise the importer will have to pay the “non-business” part of the imposed import VAT back to the VAT authorities. The use of imputed income to compensate any private / personal / entertainment use of a corporate aircraft will not exclude an EU VAT claim. The result is as expected, and the feed-back is unanimous: The term “predominantly used for business” is NOT accepted anywhere and it is simply not allowed to reclaim import VAT 100% if the aircraft is used for any uncompensated private / personal / entertainment use. The only twist is that two EU member states allow that the VAT is reclaimed 100% up front if the importer’s VAT declaration is later corrected to exclude the non-business part, which must then eventually be paid back to the VAT authorities. Even though the above result is unanimous it is common knowledge at least within the aviation consultancy industry that some service providers from the two EU OXFAM tax haven states, the Isle of Man and the Netherlands, have suggested and maybe still are suggesting solutions based on the term “predominately used”. The idea is that it is accepted to have a certain non-business use and still reclaim import VAT 100% without any correction of the input VAT or compensation paid from private users. It is unknown whether or not their local VAT authorities have accepted such solutions and whether the cases have been approved with a binding tax ruling prior to the importation. There might be differences between EU member states, but the bottom line is that the European Court of Justice has the final say. With the present picture painted by the ICIJ and the Paradise Papers, the OXFAM list and the EU Commission black list and grey list of Tax Havens it is quite certain that the EU member states, the Commission, the Parliament and the politicians in general will pursue any abnormalities. How much may an aircraft be used privately if the importer has reclaimed all the import VAT paid? 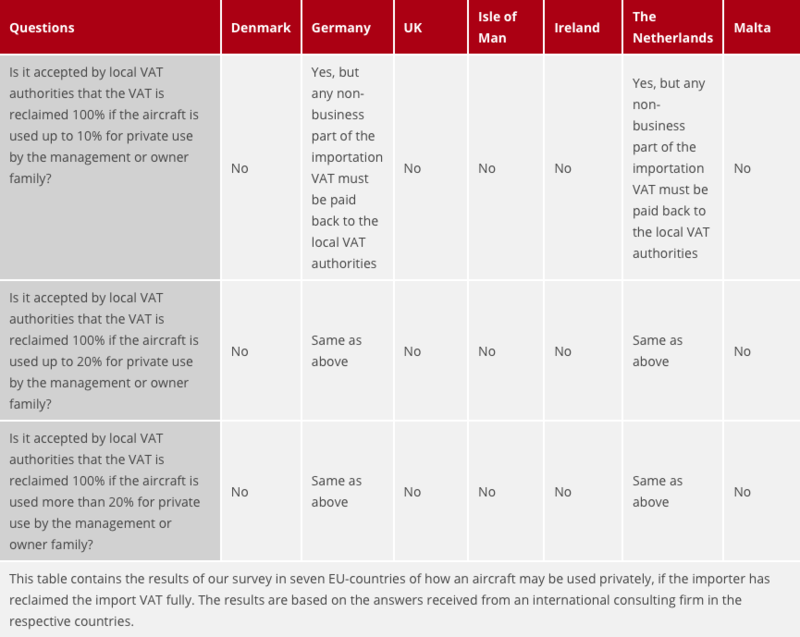 This table contains the results of our survey in seven EU-countries of how an aircraft may be used privately, if the importer has reclaimed the import VAT fully. The results are based on the answers received from an international consulting firm in the respective countries. – The VAT imposed on the importation has been reclaimed 100% by the importer. – The aircraft is used predominantly for business purposes, meaning for accepted VAT taxable economic activities. – The importer is not compensated by the persons using the aircraft for private purposes. – Private use could be, for instance, private holidays, family trips, family/friends flying along on a business trip but without any legitimate business purpose, etc. – The ratio of the private usage is known at the time of importation. – The corporate aircraft is owned and operated by the importer. The Danish survey result is as expected and in accordance with the guidelines used by OPMAS for the last many years. Most non-EU operators already use Temporary Admission. Full importation includes a lot of potential VAT/tax liability which nobody wants, and which typically requires 5 years of correct economic activity and 7 years of recordkeeping. All these factors are eliminated with the use of Temporary Admission and most non-EU operators will in fact have the same flying privileges as under full importation. Temporary Admission will give the declarant more flexibility and extra advantages such as unrestricted personal, family and guest usage also for EU-resident passengers. The Temporary Admission procedure cannot be used by EU based entities or for aircraft registered in the EU customs territory. The only option is to use full importation. It is important to analyze your usage of the aircraft and eventually consult your local VAT adviser for a verification of the exact usage. Our advice has always been to ask the local tax authorities for a binding advance tax ruling prior to any importation/admission in order to eliminate any doubt about the outcome. All cases have different details and a binding advance tax ruling will also consider all new European Court of Justice (ECJ) judgements. Even if you have a fully working set-up, we believe, an importation/admission without a binding advance tax ruling from the EU member state into which the aircraft is to be imported, is too great a risk to take. KNOW MORE: Survey 2: What does various EU VAT authorities require to accept an aircraft as VAT exempt? This update relates only to a full importation into the EU where the aircraft is not exempt as being used for commercial flights with an AOC/Charter certificate. It does not apply to Temporary Admission with total relief from import duties.